are very proud to announce that Zeitgeist's NEW ORLEANS THIRD ANNUAL MIDDLE EAST FILM FESTIVAL has officially partnered with the inaugural GAZA INTERNATIONAL DOCUMENTARY FILM FESTIVAL, the first film festival organized by Palestinians for Palestinians in the occupied Gaza Strip. In solidarity with the people of Gaza, Zeitgeist will simultaneously present three evenings of films here in New Orleans as they are screening at the festival in Gaza. Also on Sunday, November 15 and Wednesday, November 18, Zeitgeist will participate (via video conference) with the opening ceremony and Closing night/Awards Ceremony of the festival which are being broadcast internationally through Al-jazeera TV. 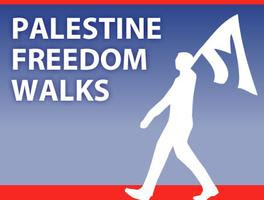 This historic co-presentation by the GAZA INTERNATIONAL DOCUMENTARY FILM FESTIVAL and the NEW ORLEANS MIDDLE EAST FILM FESTIVAL is co-presented by NOLAPS and THE NEW ORLEANS HUMAN RIGHTS DELEGATION TO GAZA. Sunday, November 15 @ 7:30 p.m.
Monday, November 16 @ 7:30 p.m.
Tuesday, November 17 @ 7:30 p.m. 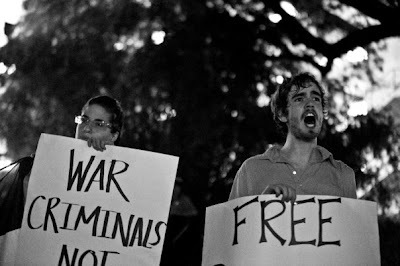 The rhetoric of Martin Luther King and Mahatma Gandhi promoted revolutionary direct action as a means to social change. 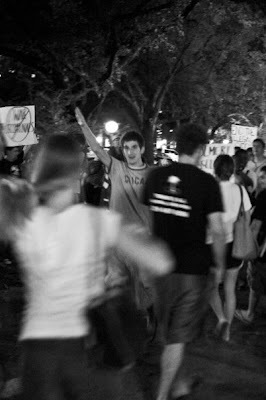 Tonight, I participated in my first non-violent direct action. Though I’m usually passive and non-confrontational, I believe it is sometimes necessary to foster a tension that a community which has constantly refused to negotiate is forced to confront the issue. Sometimes issues need dramatization so that they can no longer be ignored. Though I believe this, I’m usually not one to act on it. When others act, I have always taken on the objective role of a legal observer to ensure that protesters’ First Amendment rights are not violated. While I passionately believe in the issues folks are usually protesting, I often laugh at us as well and how crazy others probably think we are. Tonight, I was one of the “crazy ones.” I put on a new hat and experienced a powerful, deeper, spiritual, and emotional transformation. I gained a better understanding of compassion, oppression, and love for all people no matter what and gained a greater and personal understanding of the oppression of the Palestinian people. Through my direct action, I was forced to face an issue that I have known about but quite some time but had never confronted on a deeper level. 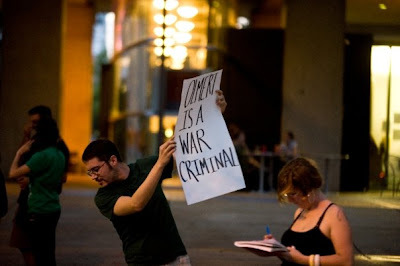 Over the past week, I felt called to act to challenge the presence of a war criminal in my city. Ehud Olmert, the former Prime Minister of Israel, was scheduled to speak at Tulane University in New Orleans. As the Israeli Prime Minister from 2006-2009, Ehud Olmert, waged wars on the people of Lebanon and Gaza, initiated an illegal siege against the people of Gaza, continued the illegal construction and expansion of settlements, continued the illegal construction of the apartheid wall in the West Bank, and continued the illegal annexation of East Jerusalem. The United Nations Goldstone Report concluded that the Israeli military operation was directed at the people of Gaza as a whole in furtherance of an overall and continuing policy aimed at punishing the Gaza population, and in a deliberate policy of disproportionate force aimed at the civilian population. The destruction of food supply installations, water sanitation systems, concrete factories and residential houses was the result of a deliberate and systematic policy which has made the daily process of living, and dignified living, more difficult for the civilian population. 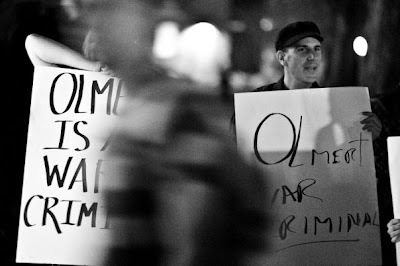 With Olmert’s scheduled visit, those who believe as passionately as I do about the dignity of the human person and human rights bounced around ideas of ways to challenge Olmert’s presence in our beloved city. While hesitant and nervous because I knew we would face arrests because the university was private property, something deep inside moved me to act. I expressed my desire to do something more with my classmate, Nikki Thanos, and we discerned together. 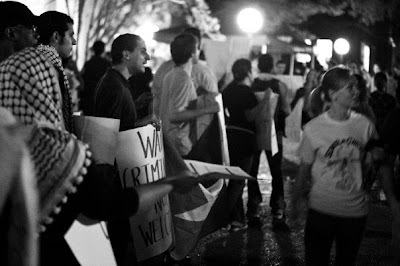 A group of about twenty of us started off with a peaceful protest with signs on the campus. 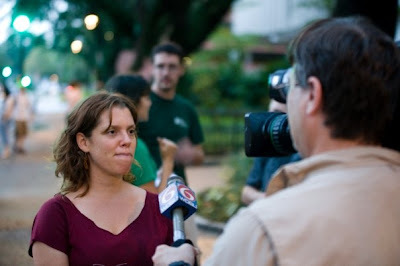 We were interviewed and videotaped by Fox, WWL, and other news networks. 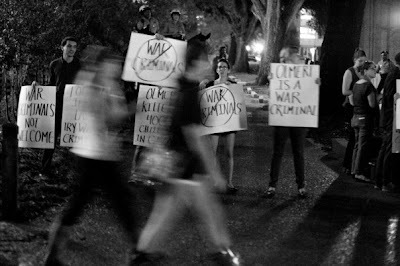 The protest grew to about forty people. When the doors to the auditorium opened, about fifteen of us entered separately and peacefully sitting throughout the auditorium. 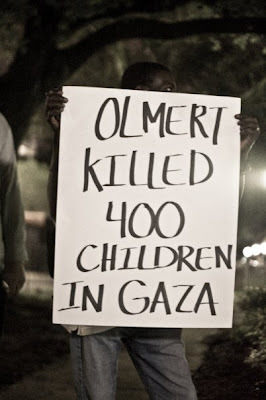 When Olmert began speaking, I placed a piece of thick red tape over my mouth that read “White Phosphorus.” Causing horrific burns, Israel has used white phosphorus shells to screen its assaults on the heavily populated Gaza Strip. 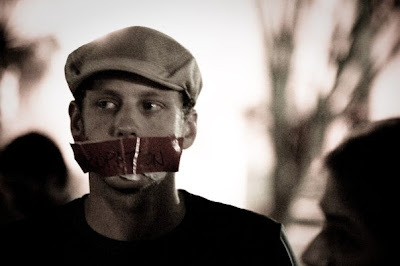 Other activists covered their mouths with red tape stating other things that Olmert did not talk about during his speech. When Olmert started speaking about the importance of profits and political power for Israel over human rights, each of us, one by one, stood up and walked out. Each time one of us stood up, half of the room would turn around to look. Though not planned as such, this created a statement and made people begin to question the words coming from his mouth. After leaving the auditorium, some joined in the larger crowd of protester. 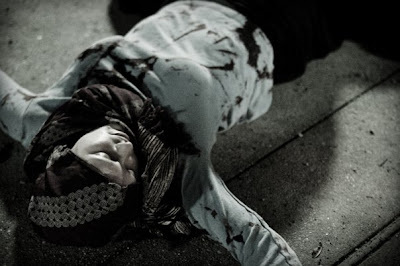 I went to the bathroom for a “costume change.” I put on a headscarf for the first time, a long black skirt, and a shirt covered in wet red splattered paint resembling the blood of the Palestinian people. Three of my close friends did the same. Coming from different directions, we all made our way to a space in front of the auditorium several feet from the protesters. 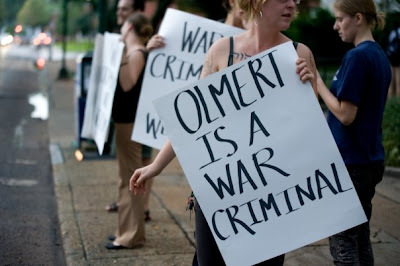 With tombstones behind us stating the number of people killed by Olmert’s actions, we assembled figuratively as dead bodies on the wet ground in the humid heat. As participants exited the auditorium, they passed us. The environment one of the most hostile environments I have ever encountered. I felt more vulnerable and at risk of being harmed as I lay there peacefully that when I lived one of the largest and most dangerous slums in South America. Educated students yelled at me, called me a f***’in Palestinian and other slurs, spit on me, and one man tried to urinate on me. During the 45 minutes of laying on the cement, I prayed for each person passing and challenged myself to love each of them as individuals even if I disagree with their actions. I prayed for all of those who live in areas of conflict and for the education and understanding of more privileged people. Had it not been for dedicated team of legal observers, about four people guarding me standing directly in front of me, and respectful police performing their duties, the likelihood of leaving physically unharmed would have been slim to none. When everyone had exited the auditorium, we got up, cleaned up, and headed home. Back to our regular privileged selves, we no longer had to directly face the oppression and hostility because of what we believed. However, brown, disempowered, and poor people everywhere cannot just get up and clean up the way I did and never be oppressed in that way again. It is something they face every minute of every day and I am thankful for the gift of being able to understand this oppression from my privileged point of view and to have had the opportunity to be in so solidarity in a silent and peaceful way with others tonight. 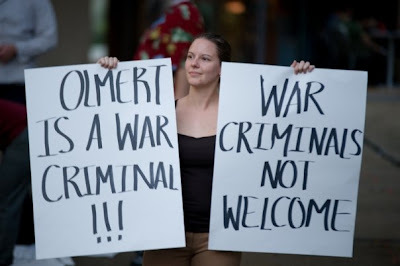 The protesters voiced their outrage that Olmert was welcomed at Tulane while a growing number of human rights organizations and the United Nations are accusing his administration of committing a wide range of war crimes and crimes against humanity, including ethnic cleansing, collective punishment, and disproportionate and indiscriminate military response. 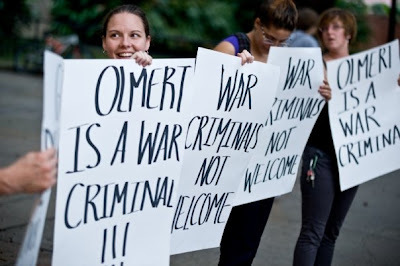 The demonstration was part of a series of community responses to Olmert's appearance. 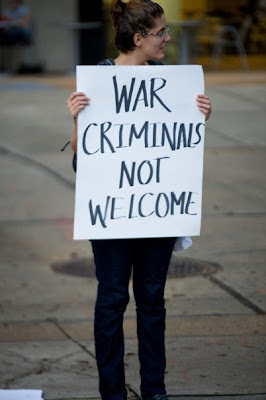 A wide range of local organizations - including several student groups (Tulane and UNO Amnesty International and UNO GUPS), community organizations, and the American Arab Anti-Discrimination Committee of New Orleans, the local branch of the nation's largest Arab-American civil rights organization - were a part of the demonstration, both out of concern for the ongoing humanitarian crisis in the Gaza Strip and to condemn the US collusion with Israeli violence. 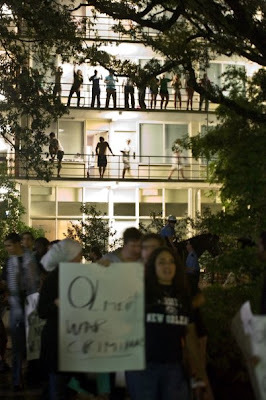 Tulane Students blast music and throw food from their dorm balconies at Pro Palestinian activist who were on campus to protest Ehud Olmert's speech. 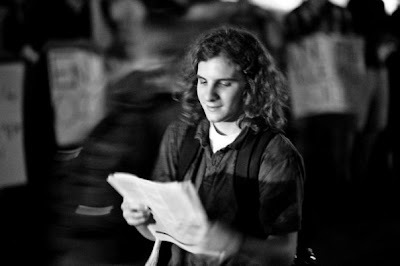 A Tulane Student Seig Heils through the middle of a Pro Palestinian Protest in front of McCalister Auditorium at Tulane University during Ehud Olmert's speech.